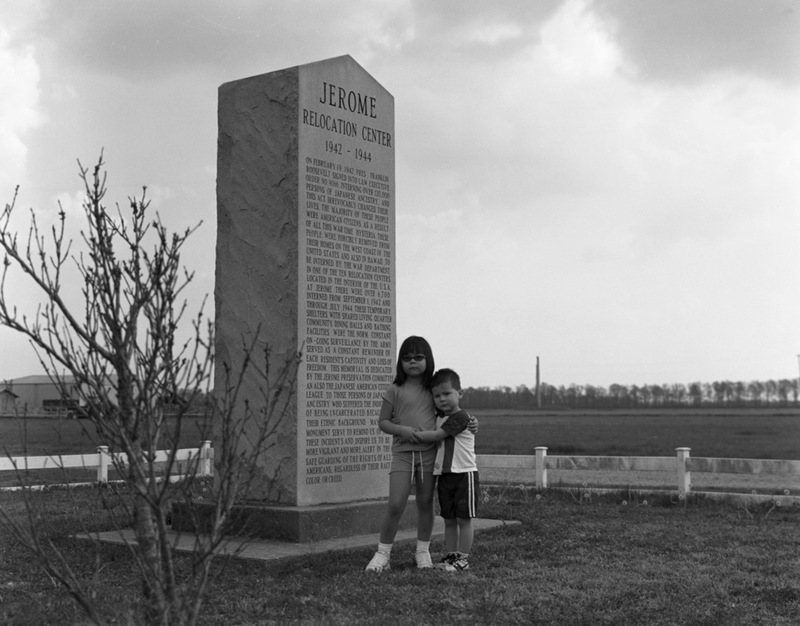 As Japanese Americans, we can state, without much argument, that we have a shared history. Specific events occurred over the span of time that constitute our existence as a community. We relate to our history through memory and citation. 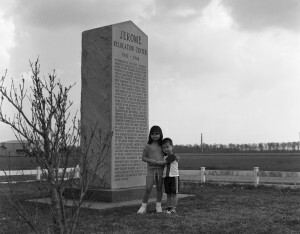 As Japanese Americans, do we have a shared, communal memory? The evacuation and incarceration of 120,000 people of Japanese descent from the West Coast during World War II is the most significant single event in our community’s history. It was massive in scale and devastating in its impact. The ramifications of internment have shaped the Japanese American community for seventy years. While it is a concrete object of our history, is it part of our collective communal memory? How do Japanese Americans with little or no direct relationship to internment relate to the fact of it? These are issues that are dealt with in surprising depth and scope at an art gallery in a small public college in Southern New Jersey. 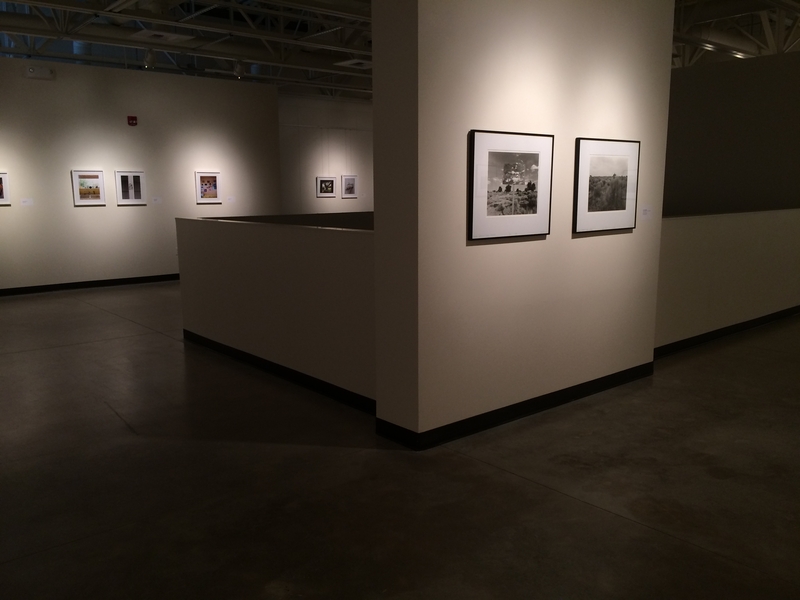 Photography by Kevin J. Miyazaki and Jon Yamashiro at the Richard Stockton College of New Jersey Art Gallery displays the work of two Japanese American artists who neither live nor work in mainstream Japanese American environments. Each artist has created work that explores their direct relationship with the internment of Japanese Americans, which occurred more than twenty years before either artist was born. 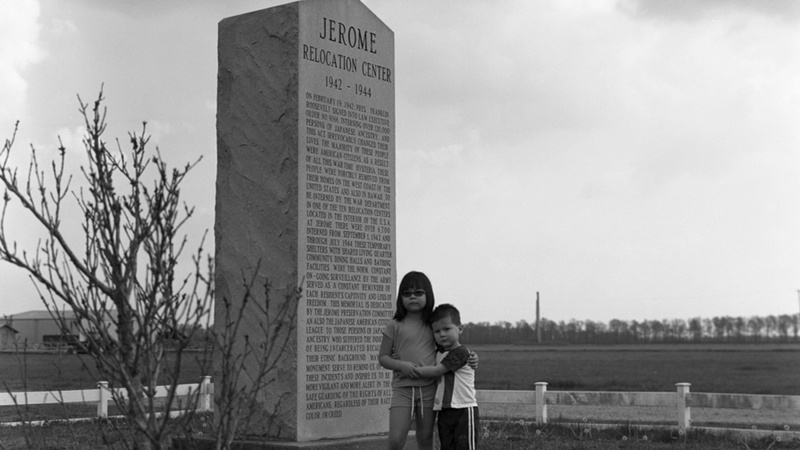 One artist sees the later repurposing of the detention camp buildings as a connection to his deeper understanding of the internment experience and the meaning and value of “home.” Another makes a pilgrimage to each major camp, seeking his own relationship with internment and sharing that experience with his family. The show was curated by Wendel White, a photographer and Distinguished Professor of Art at the college. Jon Yamashiro was born in Hawaii, the grandchild of Okinawan immigrants. His grandparents settled in Oahu in the late 1920s and his father recalls playing outdoors one day and seeing Japanese planes overhead, on their way to bomb Pearl Harbor. Living in Hawaii, no one in his family was interned during World War II. After graduating high school in Oahu, Yamashiro attended college at Washington University in St. Louis. He is currently a Professor of Photography at Miami University of Ohio. He lives in Indiana with his wife and two young children. In conversation, he further explains the genesis of the project, in which he visits and photographs all ten major internment camps, accompanied by at least one of his two young children and his wife. His photographs are of the camp sites as they exist today, in varying states of maintenance and disrepair. His young son and daughter are present in most of the photographs. The pictures are black and white and, while often stark and plain, they envelop the past, the present, and future into single statements of reflection and optimism. Engaging with the camps connects Yamashiro and his family with their ethnic culture and teaches them about the nature of race in mainland America. The historical “fact” of the camps is counterbalanced by the spiritual weight they carry. Kevin J. Miyazaki grew up in Wisconsin, aware that his father’s family had been interned in Tule Lake and, later, Heart Mountain. 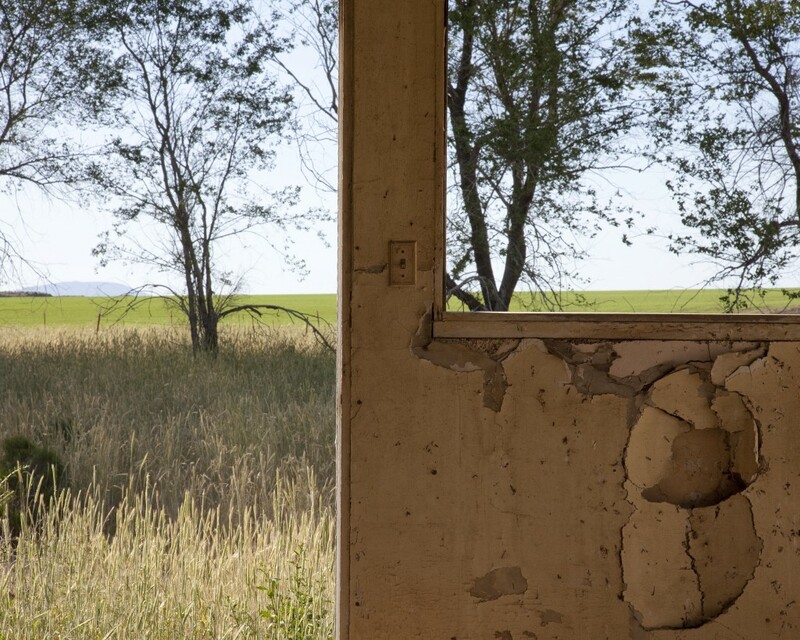 On a trip to Northern California, he found himself at a museum near the Tule Lake site where, in addition to information about the internment of Japanese Americans, he discovered that, starting in 1946, many buildings that had housed internees during the War had been offered to homesteaders to resettle the area after the war’s end. These homesteaders were American veterans of WWII who participated in a lottery to work the land for an ownership stake. Buildings from the camp site were offered to lottery winners and moved to the homestead properties. Miyazaki began to seek out the repurposed buildings and the people who lived in them. “What I’m most interested in is the houses,” he says. He later discovered that the same arrangement followed the closure of the Heart Mountain internment camp – returning veterans homesteading the surrounding area, using internment camp buildings as domiciles and work structures. He made a trip to Wyoming and repeated the process of identifying, visiting, and photographing the buildings. The resultant photographs that comprise Camp Home are simple images of American homes and workplaces that do not, on their own, seem to exist in the context of the internment of Japanese Americans in World War II. For Miyazaki, the story of the repurposed use of internment buildings was his vehicle to engage in his personal relationship with internment. 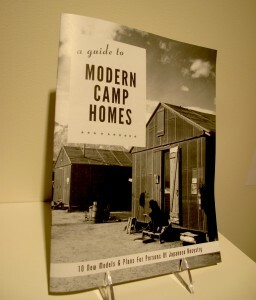 Also included at the Stockton Art Gallery is Miyazaki’s book, A Guide to Modern Camp Homes: 10 New Models & Plans for Persons of Japanese Ancestry. From 1908 through 1940, Sears Roebuck & Company, like other consumer catalogues of the day, merchandised “modern” homes for sale and delivery to an expanding American middle-class consumer population. Until December 7, 1941, the West Coast Japanese American community was fully immersed in that upwardly mobile society. The result, Modern Camp Homes, is an “artist’s book,” essentially a mock Sears Catalogue merchandising “home” for prison-bound Japanese American internees. Miyazaki uses the upbeat language of the catalogues of the time and the burnished, positive images of internment sourced from the National Archives, including photographs by Ansel Adams and Dorothea Lange. He commissioned architectural drawings of camp structures to add to the thoroughness of the imitation and includes General DeWitt’s infamous “Instructions to All Persons of Japanese Ancestry,” as a welcoming introduction. The result is an unsettling, sardonic compendium of an idealized version of life in the camps that underscores how much “home” the Japanese American internees irretrievably lost. We think of photography as a medium entwined with memory. We take pictures at key moments in our personal history and view them at a later time, when they evoke recollection and emotion. 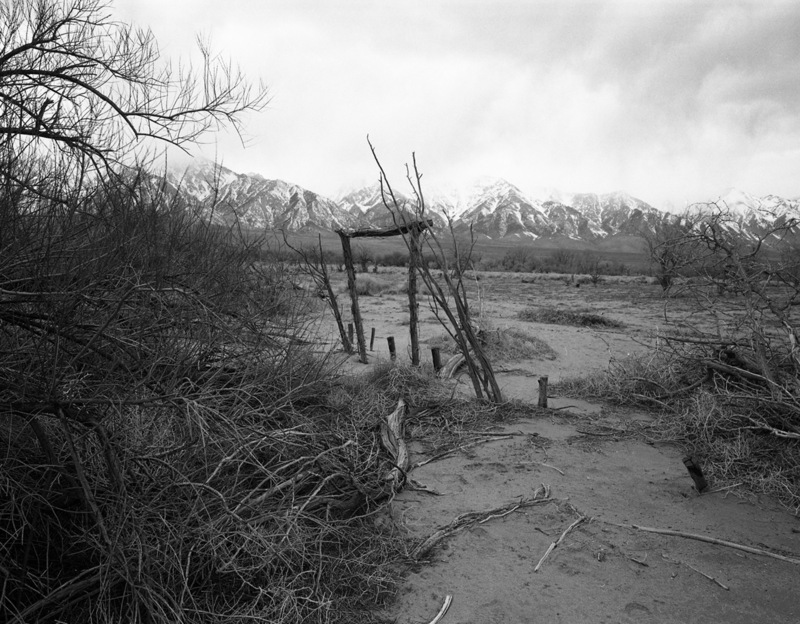 Ansel Adams, often cited as one of the greatest American photographers, went to Manzanar Relocation Center in 1943 and photographed the camp and the internees who lived there. Those photographs were gathered into a book and exhibit entitled Born Free and Equal. Seven decades after Ansel Adams went to Manzanar, two Japanese American photographers engage the internment camps as they exist today. Miyazaki sees a different sustaining and positive life emanating from the physical foundations of the internment camps. This new life is imbued with the same values of family, hard work, and legacy that Japanese Americans lost in the camps. Yamashiro uses the remnants of the camps today to enter into a discourse with mainstream America, the mainland Japanese American community he has not known, and his own family. He engages generations past, present, and future. Their work is honest, soul-searching, and optimistic. It affects us deeply, conveys our historical truth, and gets below the surface of imagery to mine a communal memory the artists themselves may not have known was there. Kevin J. Miyazki’s Camp Home and Jon Yamashiro’s WWI Japanese Internment Camps will be on exhibition until Sunday, March 23 (closed during the college’s spring break, from March 7 through March 16). For more information, please visit the Stockton Art Gallery’s website. Tamio Spiegel is an independent consultant who has advised businesses in Asia and the US on manufacturing, product development, and cross-Pacific trading. He is a past Executive Director of The Gohan Society, a New York City-based non-profit organization that promotes Japanese food and food culture. He has written on arts and current affairs for NY Nichibei, AsianWeek, and Nikkei Heritage.